One of the newest furry conventions, Fangcon, opens its doors Oct. 26th to its awaiting audience. Located in Nashville, Tenn., the event's theme is: Musicals: Opening Night! This will really come out when Rhubarb the Bear performs as the con's Musical Guest of Honor. This bear has brought a few musicals to the fandom. He most recently premièred at Wild Nights to a standing ovation crowd performing Fosgate: Ferret Loan Officer. He will be bringing his musical skills in the form of several instruments to his own show and several panels. He's not to be missed! Something attendees might find appealing is that we will be offering the Super Sponsors of the con a neat perk – a beer keg for their use. If all goes well they might even break open a second one later in the con’s weekend. A number of perks are planned for the upper membership, including autograph and contact books, personalized sketch books, an Aurora badge and more. You can only get these with the upper membership admission. You can get that happy feeling by being a part of the wine tasting that Fangcon will be offering. This will be a separate admission event during the con and something to look forward if you like to learn more about wine and would want to experience trying the different wines of the fermented grape. 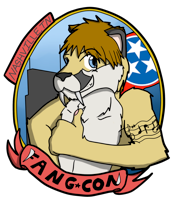 If you wish to be a part of this look for details on the Fangcon attendee forums. As far as stealing a bow, that would likely be Calamity Cougar, our Fursuiter of Performing. As one of the few “talking” fursuiters of the fandom he is one of the one of the most well known for his redneck slang and antics through other cons he has attended. He will be emceeing the Furry Drama Show at Fangcon this year. So if you would like to submit a video, sing a song, have an instrument you can perform or have a skit you can learn more about the FDS at its website. Interested parties can contact the show cast on the forums. You need to contact our people to get your seat in our show. Bunny and Brandon Lynx at Registration will be offering some of the best seats in the house. Buy your admission now and that gets you into the door. Those who pre-registered, prepaid and attend will be offered goodies for doing so: free themed autograph books, bookmarks and other swag you cannot get at other venues. For our uppermost membership look for a free themed personalized sketch book to celebrate. Pre-registration is now closed, but you can view pricing at our website. And what a show it will be! Rhubarb the Bear will be there busking in the hallways and performing his own shows as well. Vivaldi will also be The Music Man for his own Friday musical show. On Sunday scheduled is Husky in Denial with his own performance. If you also want to catch all of them and maybe more in their own “Jam session” where who knows what will happen. There is also something else to look forward to as our understudy artist Wolfaya steps up on the stage as the artist GoH. She has been cranking out the artwork all year long for Fangcon and the critics are raving about her – see for yourself at her Fur Affinity gallery. We are told she is expecting so we will be having a name the baby contest at the con. Who knows what we will come up with. Since she is expecting… and we mean VERY expecting… there stands a chance she may not be able to attend parts if not the whole con. The length stars will go to avoid the limelight! So remember, the theme is Musicals so register soon before all the tickets are sold out! Hope to see you at Fangcon 2012! A member of the fandom since the infamous CSI debacle, Jace has slowly built his way into the life of furry. Joining deviantArt and later Fur Affinity in high school, he built up his friends in the community, though never had a local group to get close with. While at Vanderbilt University, Jace met with Frocta at a local coffee shop, which through much care and nourishment grew into a huge weekly fur meet. Now graduated from college, Jace has been working as the Secretary for FangCon's inaugural, as well as a moderator on the Tennessee Fur Forums, and acts as an active member of the Nashville Furry community, frequently hosting meets at his apartment.